When Tyler Fisher joined Gordon Memorial as Chief Information Officer (CIO) in 2011, the hospital’s entire IT infrastructure ran off a single server, which proved inadequate for the hospital’s existing needs. IT infrastructure was a top priority for Gordon Memorial, as well as an upgrade of the hospital’s IT network in conjunction with the installation of a new telephone system. To help improve patient care and reduce IT costs, Fisher conducted a detailed review of technology solutions and selected MEDITECH 6.0 EHR software running on a VCE Vblock™ System. 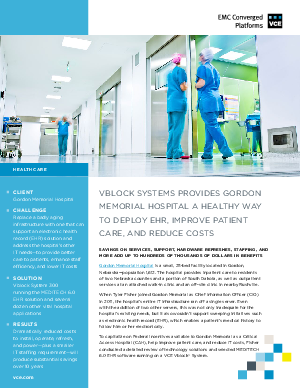 The solution was two-fold: the hospital system’s advanced converged infrastructure was able to deliver the extraordinary efficiency and agility of virtualization to enable Gordon Memorial to meet patient requirements in today’s uncertain healthcare environment. In addition, VCE offered a state-of-the-art backup solution essential for protecting EHR data.